Hinge allows the user to set the extension stop at 0, 15, 30 or 45 degrees. 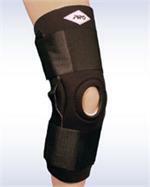 Constructed of ¼” thick neoprene and features an orthopedic felt horseshoe for added patella stabilization. Two elasticized straps provide additional personalized fit and comfort. 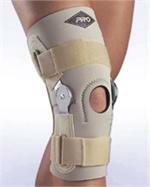 The unique hinge used in this support has a built in deceleration mechanism that allows the knee to adjust to the forces as you extend your leg. 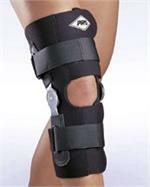 The quadriceps co-contract along with the hamstring which adds to the stability of the knee joint. For the athlete 6’ and taller. The hinges are 4” longer and the sleeve is 5” longer than our original 190 to provide better support for the taller wearer. The elastic straps are also increased to 4” widths for additional support. 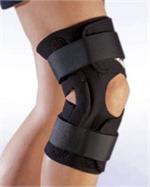 Wrap-around design provides additional hyperextension protection. Hinge allows the user to set the extension stop at 0, 5, 30 or 45 degrees.Constructed of ¼” thick neoprene for added support. Two elasticized straps provide additional personalized fit. 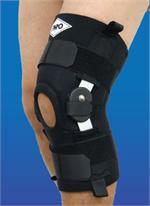 Easy to apply anterior closure, open popliteal and patella areas for additional comfort. Adjustment straps allow for "custom fit", dual pivot point hinges provide support through full range of motion and will not "piston" like single pivot hinges.